Best chum you can buy. They just come to it. I’ve been using different concoctions and even tried the commercial stuff. This chum out performs anything I’ve ever used. It creates a long slick in a matter of minutes. I’m back to order a case. Great product!! 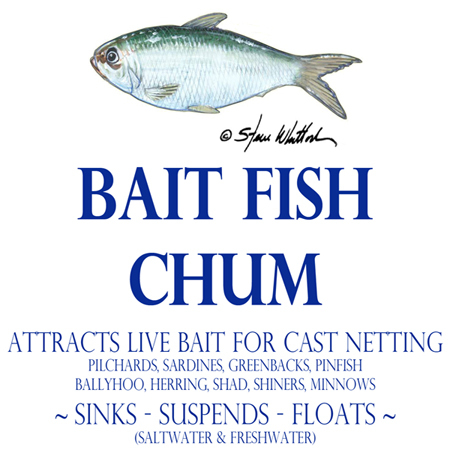 I gave the chum a shot this morning and it worked great!! Fills my big 65 gallon live well with bait with ease. You’ve got a winner, the chums the cheese! Been using it to get bait for my charters and highly recommend it if you want to have a one and done morning. Tried it myself today and loaded up. Bait has been a struggle lately and this chum works. Gets everything quick, get some! Sold out at D&D in a day! It does work. 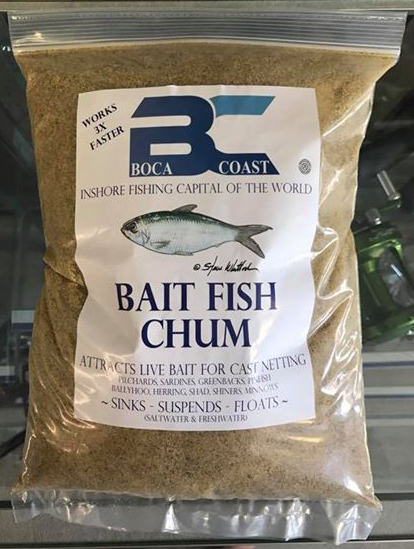 It works better than any other chum I’ve ever used hands down. For a weekend warrior who hasn’t quite mastered netting perfect bait, I’d say this sure upped my bait game on the flats. Everyone and their mother is going on and on about this new chum so it must be doing its job. My business relies on bait. No bait = No pay. Been using your chum for a couple months now and there’s no doubt it makes a huge difference. We’ve all been using the saw dust fish food powder for years and it takes forever. For me that’s the key difference and what matters. It works in minutes and I’m headed towards fishing when everyone is still trying to get a slick going. I’ve had a couple throws recently that were so heavy I had to pull it up in sections. Haven’t done that in years. It also works great off shore. Brings them right up. 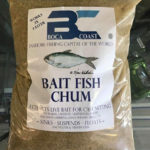 It takes bait to make fish, no doubt about it my boca coast chum keeps my live wells full. Started using the Boca Chum to separate the pins from the white bait, and man IT WORKS! they just come right in and very obviously aren’t scared away by the pin fish or boat. Stuff is amazing and I’ve been tossing Purina and everything else for 20 years. Been going through half a bag each morning and blacking out the well in 10 minutes. $8 in chum for a $400+ day is money well spent. Buying another case today. Obviously everyone is using this stuff to catch bait down in Florida. I saw an instagram video of a guy using it for ice fishing and ordered a bag after seeing how well it worked for him. You guys need to re-brand this stuff pronto!! I sprinkled in a handful every ten minutes and caught more fish than ever before. Big fish too, they just come in to it and I had non-stop action all day. If you’re ice fishing and reading this, buy a bag or two and try it. You will not be disappointed. I’m back to order a case today! This is my new secret weapon. I have to tell you…went to Boca all day today. 7 boats chumming and chumming and throwing and chumming. We chummed for 15 minutes, threw the net 3 times and done. We invited a guy and his 2 sons right next to us. He was throwing the regular fish food chum. They wouldn’t go to his chum. I threw my net twice and handed him the bait. Your chum works!!!!! Ditto 👆 Pulled up behind devilfish in Boca. Several other boats chumming but not seeing any bait being brought up. Threw 3 small handfuls of Boca coast chum, tossed the net twice and was loaded up for the day. Love this stuff.